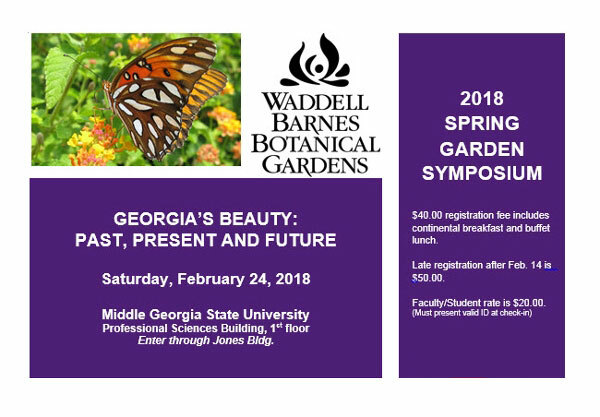 MGA's Spring Garden Symposium Focuses on "Georgia's Beauty: Past, Present and Future"
"Georgia's Beauty: Past, Present and Future" is the theme of the 2018 Spring Garden Symposium, scheduled for Saturday, Feb. 24, hosted by the Waddell Barnes Botanical Gardens at Middle Georgia State University (MGA). Register online at https://eventpro.mga.edu/EventProConnect/Default.aspx. Password is SPRING. For more information, contact Laura Gay at 478-471-2780.